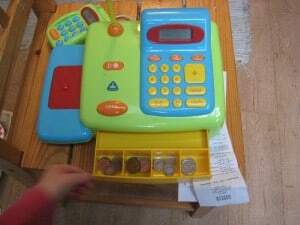 A till – we have a toy till which we filled with real (small denomination) money. If younger children are playing – who might be tempted to put the coins in their mouth – you might like to make some enlarged replica coins from cardboard (which you might like to laminate) so they can’t swallow them. If you haven’t got a toy till already you might like to add one of these to your Christmas list – or simply use yogurt pots filled with the coins instead. Add some old till receipts from your purse. 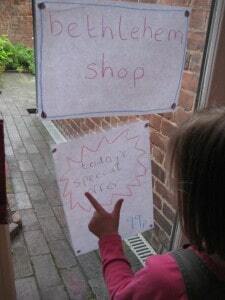 Something to sell – we made a grocery store and used some toy food and some egg boxes and empty packets of food. Baskets and bags / purses – We have a couple of mini shopping baskets and each child had an old handbag with a purse with a few coins in. 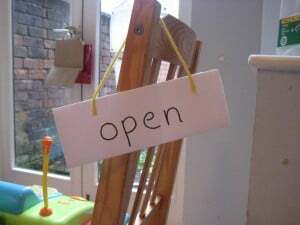 Signs – making an open/closed sign and some listing the shop’s special offers is a good way to sneak in some letters and reading. As you can see, we are nativity play crazy here so our store is called the Bethlehem Shop! 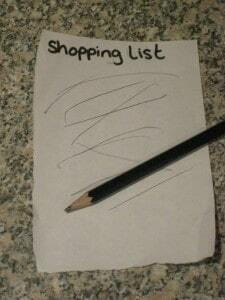 Shopping lists – provide some paper and pencils and give the children a chance to practice ‘writing’ with a purpose, so they don’t forget anything on their list. 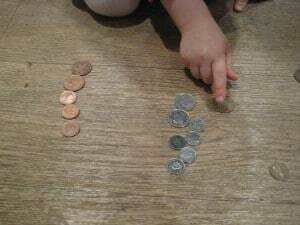 In addition to role-playing the shopping experience, with a child being the shop keeper and some being customers, using coins allows you to include some maths skills. 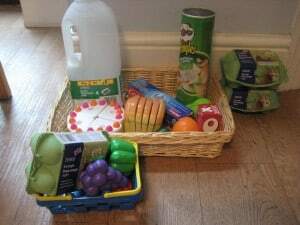 You can add price labels to the food and help the children count out the right number of coins to buy what they want. You can also sort the coins into denominations to put them in the right till drawers – which works on classifying and matching skills. 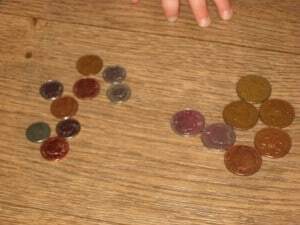 One child playing today was really interested in the coins and spent time sorting them into colour groups and also size groups. Just shows that providing children with open-ended resources allows them to be creative and explore areas which they are interested in. Toy shops are a great way to learn about money – which, of course, involves a lot of counting, addition, subtraction, and even multiplication!